As the former presenter of the morning show on Smooth FM Radio Russ Williams woke up millions of Britons every day with his amazing voice along with an exceptional playlist, as well as presenting ‘ Scores ’ on LBC London News 1152 am every Saturday from 3 pm to 5 pm. 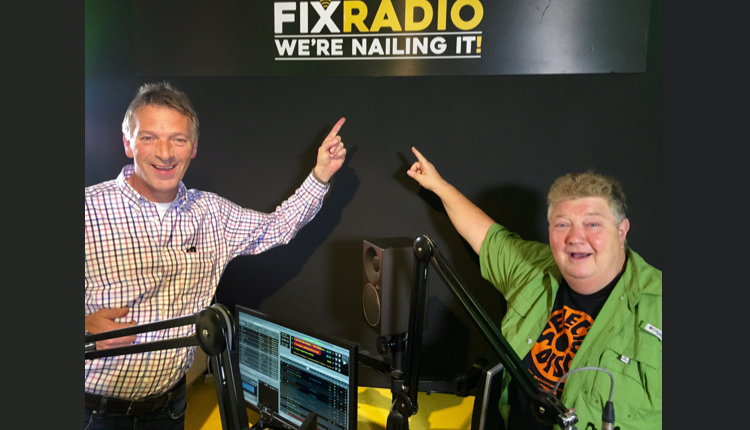 Now Russ Williams is heard daily on the Russ and Jono Show on Fix Radio daily from 8am. Russ Williams commenced his career at Southern Sound in Sussex after training at The National Broadcasting School in London. Russ then joined Metro radio in 1987 – 1990 before joining Capital Radio to work for Richard Park in London. For 5 years Russ hosted ‘The Russ and Jono Breakfast Experience’ with Jonathan Coleman on Virgin Radio to audience and critical acclaim. They won the Sony Radio award for ‘Best Breakfast Show’ during their tenure. Russ did the first show in 1993 and the station’s last broadcast in 2008. Russ had an amazing time hosting his daily mid morning show at Virgin Radio / Absolute Radio where he talked to millions of Briton’s every morning for 17 years and the Breakfast show for five years. Russ has hosted many ‘Live’ specials for Absolute Radio including Bruce Springsteen and Bon Jovi in Hyde Park, has been on tour with the Rolling Stones for a documentary series and interviewed some of the biggest names in Rock including Roger Waters, AC/DC’s Brian Johnson, Yes, Jethro Tull and many more. Russ Williams accumulated three Gold Sony Awards during his 22 years at One Golden Square as well as a coveted New York Radio Award for his Breakfast Show. He also picked up another Gold in 1997 for best comedy competition. Aside from radio, Russ is an experienced television presenter and voiceover artist. Russ’s first TV show was presenting Sky Sports “Soccer AM”. He next presented Sky Sports live Nationwide Football coverage before ITV asked him to become one of their anchor presenters. He has also presented ITV’s Snooker, Italian Football, Boxing and The Champions League, and he voiced ‘The Premiership’ every week. Russ has also presented entertainment shows including “This Morning”, Channel 5’s “Wowfabgroovy”, Sky One’s “Worlds Weirdest TV” and “Miss UK”. Russ is also a trained journalist. He has had two books published; “Football Babylon” and “Football Babylon II”, both bestsellers. The books recount a collection of unbelievable footballing tales from around the world. He also penned a “Football Babylon” column for The Sunday Express, as well as writing occasionally for 90 Minutes, Total Football and Sky TV Guide. Russ wrote a weekly column on Football for The Express on Sunday and has written for The Times and The News of the World. Russ Williams is versatile and talented in all fields, ranging from radio broadcasting, sports and TV presenting, voiceovers and the written word. In December 2013, a great radio honour was bestowed on Russ as he was admitted into the Radio Academy Hall of Fame. In early January 2014, Russ was invited onto the prestigious panel that decides the Barclays Premier League manager and player of the month. The panel is made up of representatives from the Premier Leagues broadcast partners as well as the PFA and LMA. Russ is the winner of two Arquiva commercial awards for ‘ Best Specialist ‘ programme for Absolute Radio’s ‘ Rock n Roll ’ Football. Russ hosted the Breakfast Show on Smooth FM daily from 6 am to 10 am as well as presenting ‘ Scores ’ on LBC London News 1152 am every Saturday from 3 pm to 5 pm. Away from the studio Russ enjoys Golf and his passion for Japanese gardens.